This is an absolutely beautiful exposition of the idea that a universal state is the best for the flourishing of man. I'll let the words speak for themselves. So wrote Donald Nicholl in his introduction to the English translation (Noonday Press, 1954) that I used for this essay. There is a sense in which his assessment remains true 49 years later. It has been a long time since many people had much enthusiasm for the Holy Roman Empire, which was the particular instance of universal polity that Dante was defending. The paucity of translations of De Monarchia into English might also be taken as evidence of lasting irrelevance. (The Latin original is, oddly enough, available online, at no charge.) Some things have changed in the past half-century, however. The prospect of new forms of transnational governance is often discussed these days, either as a promise or a threat. Moreover, the dream-like abstraction of Dante's arguments may allow for modern re-interpretation in a way that would not be possible to a more concrete and historically grounded analysis. It is very unlikely that De Monarchia will someday be hailed as a guide to restructuring the international system. Nonetheless, in intellectual history, there are some issues that never really go away. In this book, Dante gives us an early formulation of some perennial ideas. Even the most Platonic political theory has some history behind it, of course. Dante Alighieri (1265-1321) was born into Florence's Guelph party, which was the faction that generally supported the papacy against the Holy Roman Empire. (The imperial party was the Ghibellines.) Briefly a member of Florence's governing council, he was exiled in 1301, when the Guelph faction that was backed by France took control of the city. The French were there because Charles of Valois had entered Italy at the pope's invitation to restore order to the peninsula. The next year, Pope Boniface VIII issued the famous bull, Unum Sanctum, which advanced the broadest claims to the supremacy of the church over temporal authority, particularly over the empire. De Monarchia may be considered an answer to those claims; or maybe better, their dialectical opposite. 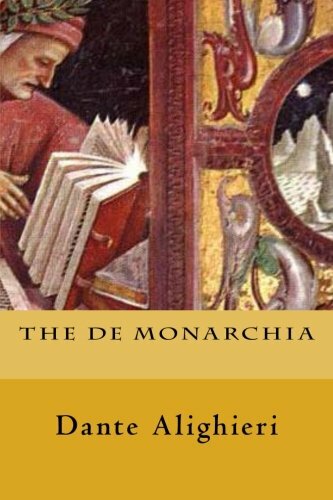 De Monarchia asks three questions: Is the secular monarchy necessary? Did the Roman people receive the monarchy by right? Does the monarch receive his authority directly from God, or through the intermediation of some minister of God? These terms require a little explanation. By “monarchy,” Dante does not mean simply the rule of a single individual, though his argument does tend toward the Aristotelian proposition that legitimate monarchy is the most perfect form of government (in contrast to tyranny, which is monarchy's opposite and the worst form). The later Roman Republic was the “monarch” of the ancient world, in Dante's terminology. De Monarchia is really about the structure of the international system. As for the “Roman” element, Dante does not distinguish between the Republic and the Empire, or between ancient Rome and the medieval empire. So, then, to take Dante's first question: Is the secular monarchy necessary? Remarkably, Dante derives the necessity of monarchy from an argument that is almost Hegelian. Universal government is necessary, because it is the way to universal peace; universal peace is necessary, because it is the only way the human race can attain its end, or purpose; this end is actualization of the “possible intellect,” which is possessed by the human species as a whole. The possible intellect got Dante into a lot of posthumous trouble; it was one of the reasons De Monarchia stayed on the Index of Forbidden Books from the 16th to the 19th centuries. The notion comes from the 12th-century Iberian Islamic philosopher, Averroes (Abu al-Walid Muhammad ibn Ahmad ibn Muhammad ibn Rushd), who deployed it in a way that argued against personal immortality in favor of a collective human soul. Dante himself thought no such thing, of course. His version rests on the scholastic commonplace that human beings are only partly intellectual beings (unlike angels, whose substance is intellect). Because of this defect, no single human being, however intelligent, could fully embody the intellectual capacity common to the species. That could be done only collectively and, since knowledge is cumulative, historically. The human species, if it is to achieve the state of intellectual perfection possible to it, required a peaceful and therefore unified world. Since the 19th century, we have been more inclined to expect the advancement of intellect to come from competition than from harmonious peace. To that, perhaps, a medieval would have argued that even a market of ideas requires rules to keep the market functioning. Certainly a dynamic world is not quite contrary to the medieval ideal of the tranquility of order. Be that as it may, Dante insists that the ideal political order is a universal polity. The good inherent in the whole, he explains, exceeds the good inherent in the parts, though these parts may have an internal constitution that resembles the order of the whole. Thus, only a polity that encompasses the whole human species could really be perfect. The universality of the universal monarch would not be expressed by promulgating the positive law for every district. Rather, the universal law would be a common law, which deals only with those things all men have in common. Neither would it mean that the several nations could not have their own princes and other magistrates. However, those rulers could rule justly only by virtue of their relationship to the universal monarch. This is essentially the same argument that Julius Evola made in connection with his critique of 19th century imperialism. An empire in competition with other empires for national glory was mere violence, in his estimation. The distinction between “the empire” and “an empire” is also fundamental to the analysis of the postmodern world in Antonio Negri and Michael Hardt's book, Empire. They point out that the global system of governance has a moral basis that was lacking in the competitive empires of early modernity. The empires were imperialistic; though they might sometimes benefit their subjects, they were founded on ambition and greed. The “empire” of the late modern international order, in contrast, though it may cause endless disaster, is founded on the principle of eternal justice. The former were imperialistic; the latter is imperial. All things being equal, the universal law would better be made by one agent, rather than by several, according to Dante. Human concord can be attained only by a concord of wills, which needs a human director. One may note that this reasoning would work almost as well as an argument to move beyond a law of nations enforced by nations to a world system with a genuine executive, if not necessarily a “monarch” in the conventional sense. Dante, who spent the last two decades of his life in exile because of the chaos among the petty states of Italy, saw nothing odd in also asserting that the empire is necessary for human freedom. Freedom is the perfect condition of man, the state he was designed for. However, man is free only when his judgment may operate undeflected by the appetite. The monarch could create the institutional basis for a society in which the most people would be able to approach this condition. This is because only the monarch could himself be entirely free; having the greatest honor in the world, there would be nothing further for him to desire. Thus, being wholly disinterested, his reign would have no object other than the common good. This reasoning might perhaps seem non-obvious to moderns, who are quick to point out that the road to Hell is paved with good intentions. Neither would there be general assent today to the proposition that satisfying all a man's desires would necessarily make him a good person. On the other hand, Dante's reasoning does bear a family resemblance to Francis Fukuyama's hypothesis that liberal democracy is the end of history because it satisfies all aspects of human nature. Moreover, there have been several recent arguments to the effect that something very like Dante's empire is necessary to human freedom, or at least to the highest level of human freedom that is possible in much of the world. So said Niall Ferguson, in yet another book named Empire, with respect to the British tradition. On a somewhat higher level of abstraction, that is also what Patrick Kennon says in Tribe and Empire. The modern apologists for empire use reasoning that is not as different from Dante's as might at first appear. They say that the empire is the institution best suited to mitigate ethnic strife, because the empire is transnational and, like the monarch, disinterested. Further, Dante says that only the perfectly free monarch can impart a measure of freedom to the wider world because only he possesses this quality himself; similarly, only a liberal democratic empire could impart liberal democracy to societies that lack it. “On the basis of this exposition we reason as follows: justice is most powerful in the world when located in a subject with a perfect will and most power; such is the Monarch alone; therefore justice is at its most potent in this world when located in the Monarch alone. This procedure tries to reach conclusions about the world by arguing from first principles. In effect, Dante formulates archetypes and then hunts for their incarnations. This type of metaphysical reasoning has fallen out of fashion, particularly in the social sciences; but it, too, is always with us. Modern physics is littered with examples of mathematical objects that had first been formulated as merely speculative exercises, but which later turned out to describe things in the real world. This is not so different from what Dante is doing: sifting through the products of history to find incarnations of the ideal forms. This brings us to the second question: did the Roman people receive the monarchy by right? Dante tells us that the history of the rise of the Roman Empire had seemed an inexplicable wonder to him. Then he realized that the Roman people did not acquire the monarchy of the world by ferocity, but through right, guided by providence. The progress of the Roman people was at many points attended by miracles, like the history of the Hebrews. Thus we see that God approved of the empire; Christ Himself chose to be born in the “fullness of time,” the peaceful age of Caesar Augustus. Indeed, Christianity requires that the Roman Empire be legitimate. The central doctrine of Christianity is that Christ was punished for the sin of Adam. If the magistrate who sentenced Jesus was not an “appropriate judge,” then the suffering of Jesus was not a punishment, and we are not saved. Only the representative of the government of the whole world could have had the authority to inflict punishment on He Who suffered for the whole world. Providence is not always expressed through the clearly miraculous. Sometimes God's hidden judgments are revealed by the outcome of duels, which in effect was what happened when the Romans defeated all others in the contest for world empire. The empire expressed the natural hierarchy among the peoples, of whom the Romans were the noblest. Even regarded simply as a matter of natural right, the citizens of the Roman Republic were working for the public good by creating a structure of universal peace. Nations, like individuals, should resort to force only as a last resort. However, whatever is acquired in a duel is acquired by right. In the modern era, the idea that the historical process gradually expresses natural right is not rare: we see it from Hegel to Francis Fukuyama to Robert Wright. This is the intuition behind the dedication of transnationalists to the evolution of the network of supranational institutions and non-governmental organizations, which for them is now the seat of legitimacy in the world. Arguments even closer to Dante's have been made by macrohistorians who predict that the modern era will end in a universal state very like the Roman Empire. In any case, though the actors differ from theory to theory, the fundamentally providential structure of history remains. Does the monarch receive his authority directly from God, or through the intermediation of some minister of God? In a rare display of tact, Dante said that those popes who asserted the empire owed its existence to the papacy were merely misguided by zeal. However, he says that the kings and princes who follow the popes' lead in this matter are not sons of the Church, but sons of the devil. He dismisses the claims of the class of ecclesiastical lawyers called the decretalists, because it is irrational to claim authority for the Church from its own legal rulings, when it is precisely the authority to make those rulings that is in question. Much of the discussion about the relationship between Church and Empire is taken up with distinguishing the implications of a metaphor: the Church is the sun and the Empire is the moon. Dante accepts this then-common equation for the sake of argument. Just because the sun provides the moon with its light, he points out, that does not mean the existence or the operations of the moon are derived from the sun. Both sun and moon were created directly by God. The light the moon receives is more properly likened to divine grace, which makes everything appear different. In no way, however, is this illumination analogous to a grant of authority. Dante assures us that God is the lord of all things, spiritual and temporal, and that the pope is His vicar. However, it does not follow from this that the pope is the lord of all things. Vicars do not have all the powers of their principals. The pope, for instance, does not have any special power over nature. Dante also addresses the venerable allegory of the Two Swords. The proof-text is Luke 22:38, in which Peter offers Jesus two swords, and Jesus says they are enough. The lesson usually drawn from this exchange is that church and state are separate. Papalist propaganda, however, noted that the two swords remained in Peter's keeping, and so argued that both the spiritual and temporal power were both ultimately in the pope's keeping. Dante simply denies that the analogy is relevant, dwelling instead on the meaning of the verse in context. No doubt the doctrine in question is not worth much, but one wonders how a poet could dismiss such an important metaphor. The analogy of the two swords runs right through Western history. When US senators debate whether public funds should be available to faith-based organizations, that is still the pope and the emperor arguing about who has the authority to invest the bishops of Germany. Unlike in other civilizations, church and state in the West are always distinguished, even in those periods when they closely supported each other. Even when the ecclesiastical power seems to have wholly lapsed, it is natural for academics and artists to claim the privileges and influence traditionally granted to priests. Inevitably in any medieval discussion of the temporal power of the papacy, Dante addresses the Donation of Constantine. This legend, aided by some forged documents, had it that, in the fourth century, the Emperor Constantine had given the pope the authority to govern Italy and the western empire. Dante does not dispute the authenticity of the Donation, but he says that nothing more could have been involved than the transfer of a right of guardianship. The tranquility of order that the emperor protects is important for the salvation of all men. The emperor's authority is therefore providential, but the authority belongs to the office itself. The authority of the emperor could not have come from the Church, since the empire antedates the Church. Furthermore, since the emperor's authority comes directly from God, the Electors of the Holy Roman Empire do not really choose the emperor. Rather, they simply declare where the right to the office lies. I have occasionally noted that the instrument of abdication and dissolution issued by the last Holy Roman Emperor in 1806 seems to contravene the provisions of the Golden Bull of 1356, which guaranteed the prerogatives of the electors. Thus, it is arguable that emperor did not have the authority to dissolve the empire. However, even if that is a correct reading of the law (which I rather doubt), that is still not the kind of indissolubility that Dante was talking about. Even if the constitutions of the empire had contained explicit provisions for its dissolution, the empire still could not have been dissolved. Its existence is not contingent on politics; it is the one politically necessary being. The political theory of the modern era was designed specifically to do away with this kind of thinking. There have been schemes for world order in that time. Some, like the Concert of Europe, were reasonably effective. However, even the most idealistic internationalists thought in terms of positive law, of flesh-and-blood legislators creating laws and treaties with visible texts. Only toward the end of the 20th century did we see a return of the insistence that a universal law must already exist in some sense; more important, we have seen a return of the willingness to act as if such a law existed. This is as true of the neoconservative establishment in the United States as it is of proponents of the International Criminal Court. Neither group is likely to get quite the world it expects, but their worldviews are not as far apart as they imagine.